Staci Louise Smith is a talented bead and jewelry artist who works with polymer clay and metals, and is known for her organic, chunky, and innovative style. Her beads and components are instantly recognizable and her finished pieces are eye-catching. She effortlessly attains one of those rare things in the world of jewelry – a sense of composition that goes far beyond the beauty of the beads themselves. I have watched Staci’s work grow in complexity as she refines her style and finds new ways to combine materials in unique ways. I look forward to seeing what she comes up with next. She is certainly one to watch! Staci took some time out of her incredibly busy life to answer some questions and share her work with us. Enjoy! I am married to my complete opposite and we have three wonderful kids that are a complete mash-up of both of us! We also have a macaw and three dogs. Our home is never quiet, or dull. This really varies depending on what I have going on. Some days I do NO business, and other times I work 8-10 hours at it for weeks on end. How do you balance taking care of a family and running a jewelry business? By the skin of my teeth! No, seriously though, I take it day by day. If I feel the family is not getting enough time, or needs something more, I pull back on the business end a bit. I am not very organized, so I’m good at going with the flow, and leaving things undone. I have come to peace with the fact my list will never ever be done. What are your other hobbies and what do you do when you’re not working? I like to read, though I rarely have time anymore. When I read a book, I read it till the end. Nothing else gets done. No one gets fed, wash isn’t done, and I don’t sleep. Its addicting, so I don’t read much anymore. Where were you raised and where are you now? I live in a small town in Pennsylvania, about an hour outside Philadelphia. I was raised just down the road from where I live now. I have stayed in the same 20 mile radius my whole life. What is your art and craft history? Well, I grew up in a home where we were always doing something crafty or artsy. My mom did basket weaving, stained glass and painting, just to name a few. We frequented art shows too. In high school, I majored in art, allowing me to take it twice a day – WHICH WAS HEAVEN. I did take some art in college, but got married and never finished. I guess I mostly learned by doing, from books or from friends sharing techniques and tips with me. My first love was drawing and painting, from way back. However, I basically did whatever I could to be crafty or creative. I loved making gifts for people, sometimes in polymer clay, mixed media boxes or wall art, or sometimes painted slates. In college I fell in love with 3-D design. We welded steel, worked with plaster and carved wood. It was divine! I currently make mixed media jewelry using polymer clay, metal clay, gemstones, sea glass and fossils (to name a few things). I have trouble focusing on just one area, and love combining all the varied elements into unexpected combinations in my jewelry. Because I use painting techniques on my polymer clay, it allows me to get my paints out again and mix colors and such. I also get to use some of my 3-D art skills in the creation of my jewelry. So, even though I don’t have an art degree, I definitely use what I have learned over the years in my work! Have you won any awards for your work? I have! I was honored to get Third in Show at the Bethlehem Fine Arts Festival. I won First and Second place for Polymer Clay in the International Bead Dreams Competition 2014. In 2015, my work won Second and Third Place in the same competition. Oh yes, I love writing for magazines. I was honored to be featured in Belle Armiore jewelry many times for both my polymer and metal work, as well as other publications. I am also a regular contributor for Love My Art Jewelry. I started playing with polymer clay back in the 80’s or early 90’s. My brother and I made canes and plastered them on anything glass that we could find. I would put fluorescent canes on old baby food jars and make candle holders and such. He made awesome beads out of his canes. Now that I think about it, it’s funny that I didn’t make beads with polymer at the time. My favorite is still Scupley Premo. Yes. It’s the best thing I ever did for my business! Thank goodness we had a spare room that just held lots of junk! Note from Ginger: Check out how Staci painted designs on her studio floor. Cool! To get good results at selling have to promote yourself. I think for that to REALLY happen, you first have to believe in yourself. If you don’t love your art, why would others? I know that is a really tough thing for us artists at times. It’s essential though. People don’t just buy your work, they buy you, your vision, your enthusiasm. Your authenticity! You also need to surround yourself with positive people who encourage and support you. It is tough to carve a name for yourself in the big world of jewelry. Be true to yourself, and confident in your abilities and that is a great start. Can you tell us a story of a time when you had an epic failure? I have had so many. I should take a picture of my “failure” bin. Metal, polymer clay….there is a graveyard in my studio. I honestly have had too many to mention. Riveting polymer to copper was a big one for me. I broke a lot of pieces before I figured out how to do it right. Soldering has been another, lots of ruined copper piece, and melted silver. My heart has been calling me to go bigger. I want to make some sculptural pieces that are NOT jewelry. I also miss painting. So I do see me adding some 2 and 3-D art to my line in the future. As for my jewelry, I keep on keeping on. I don’t really plan new directions, they just come as fashions change, and I learn new techniques, or push forward from shapes and colors I have played with in the past. I remember the first time I saw Wendy Wallin Malinow’s work. She was featured in the Rio Grande magazine for winning the Saul Bell Award. I remember her organic sea star necklace and I was totally enthralled. It was exciting to me, to see organic shapes and forms that I have always been drawn to, made with metal clay, as wearable jewelry. Her work was whimsical and I loved it. Kelly Russell was a huge inspiration to me back then as well. Her beads had a beautiful and ancient feel to them. They were rustic and refined at the same time. She was probably my first Art Bead crush, followed by Lisa Peters. Lisa always inspired me. She takes sculpture and shrinks it down to bead form. Her free-flowing lines, her textures and raku come together to make unique, one of a kind beads that I still collect to this day. Her textures spoke to my soul. Marlee Page and Diana Contine are two jewelry artist whom were and are inspiration for me. Diana makes jewelry that tells a story. Using PMC and gemstones, she brings together many elements, and they are all in harmony, never competing with each other. I loved that. Marlee’s work I admire for the line and balance. It is never too much. She has a way of telling a story with minimal materials. It is bold, without a lot of noise. She doesn’t need much to make a gorgeous piece of jewelry. Honestly, these women influenced my world in so many ways. They still do. Each of them had brought something to life in their work, which I connected with. They showed me something that was inside me waiting to be created. I mostly sell online and at juried art shows. Right now I have some work in the Bethlehem House Contemporary Art Gallery. They change artists every few months for a whole new show, and I have had my jewelry in there for a few of those shows. I also sell from my website at Staci Louise Originals. You can also follow my work on my Facebook page at Staci Louise Originals. 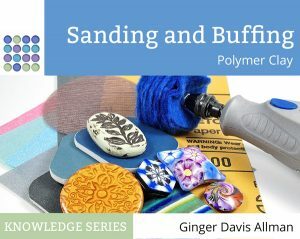 Ginger here: Do you love Staci’s polymer work and want to learn some of her techniques? You’re in luck. She sells a tutorial showing how to she creates her fantastic crackled surface. And you can learn how to make a Painted Polymer Fossil Talisman necklace in this CraftCast video tutorial. Thank you Staci for sharing your story with us. We’ll be watching! I absolutely everything she does. I’m so proud to own some of her jewelry and some of her components (which I have sitting out as decoration). She was also amazingly kind to make a bird skull for my son, who can always recognize her work when I bring a magazine home. I am coming to the party late staci as the raku firing has kept me busy 24/7 the last few weeks. I have always loved your work and am forever excited about where your next designs are going to take you! I do think we are beady soul mates – always did! Wonderful blog post and your deserve all the success in the world! Especially for those last two B & B Pieces… a big thumbs up for those dear! You are totally fearless – looking forward to whats next!